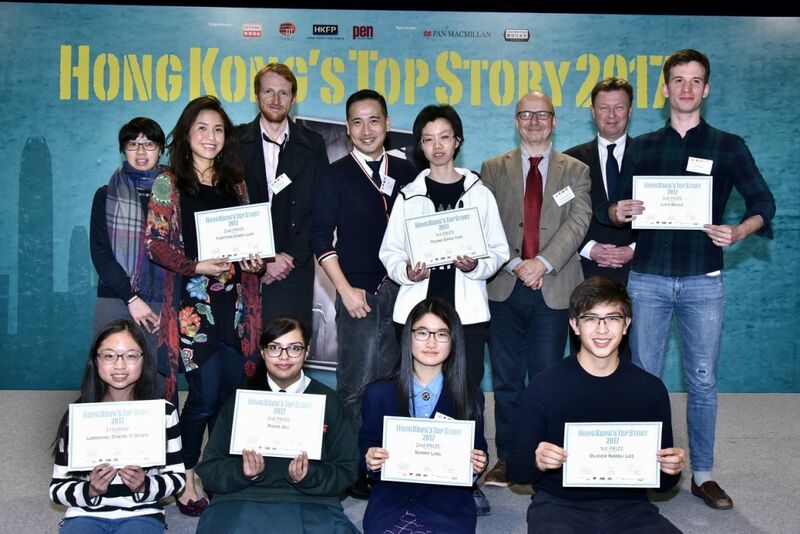 To promote expressive talent in English, RTHK Radio 3 joined with Hong Kong Free Press and PEN Hong Kong for the first time to co-organise the English writing competition Hong Kong’s Top Story 2017. From a record number of entries, the judges selected eight prize-winners in both the Junior and Adult Categories, with two more granted the Most Creative Award. An award presentation ceremony was on Thursday, January 11 at RTHK. Click here to view the adult category winner or here to view the junior category winner. The awards were presented by Controller (Radio) of RTHK Brian Chow Kwok-fung, Co-founder of Hong Kong Free Press Tom Grundy, and President of PEN Hong Kong Jason Y. Ng. Head of English Programme Services of RTHK Hugh Chiverton mentioned that the competition had again attracted a lot of talented writers to take part, and that 550 entries were received. He also praised the writers’ high proficiency in English and for turning creative ideas into effective words. Photo: Fan Ho Estate, Courtesy: Blue Lotus Gallery. This year, the applicants were invited to write an original story based on a given picture taken by legendary photographer Fan Ho. Winners in each category were presented with books from Pan Macmillan and dining vouchers from the Lan Kwai Fong Group. 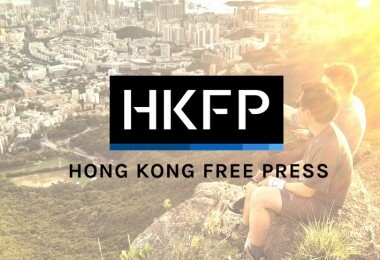 Today, HKFP shares the runners-up. We went to the Cultural Centre today for a Russian classical pianist’s recital. It doesn’t mean I know classical music, though. The only music I ever listen to these years is Anita Mui’s songs. I sometimes play her “Written in Water” album on repeat after my students have left and I am alone in my small art-jamming studio. Then I don’t have to hear Fat Keung fart in his make-shift office next door. Fortunately, Yau-yau was born on the other end of the musical intelligence spectrum. She plays the piano by ear, and she plays it 40 hours a week. Imagine fish meets water. The piano will be your best friend forever, I like to tell her these days. After the recital ended, I was going to bring her to an outside cafeteria for lunch. I planned to take the Salisbury Road exit so she would not see the exhibition in the lobby of the Cultural Center. What’s there for her to see anyway? “Mama, there’s an exhibition over there,” she said, pointing in the general direction of the crowd browsing the clusters of black-and-white photo panels. Her gifted ears must have caught the other children’s chatter. “They have this type of stuff there all the time,” I said. “Let’s go eat.” I zipped open her daisy-shaped backpack to get her eyeglass case. A new addition to her backpack. The doctor said she needed her anti-blue ray, anti-UV eyeglasses whenever she looked at monitors or spent time outdoors. He had previously uttered a bunch of other things when I went without Yau-yau, after her electroretinography test results had returned. “How much does she have left?” I asked. “So she won’t become totally blind if she wears her glasses?” I asked. “What has caused it?” I interrupted. At that moment, I felt that if I could nail down the cause, I might be able to save my daughter’s eyes. “It’s quite likely her genes,” he replied. “Her genes? She was born with perfect vision. Things only started to go downhill this summer,” I said. “She’ll need genetic tests to find out,” he said. I haven’t been in touch with her father since she was two (she’s now six), but I am certain I am the one who has passed it to her. I have what they call, “lazy eyes”— something I used to my advantage when I was in my teens and my mother complained about my not reading the Bible. “But I want to look at the pictures,” Yau-yau said. She wants to look at the pictures. “Just five minutes. I’m hungry,” I said. “A tapestry of Hong Kong’s working-class memories from the 1950s and 60s,” I mumbled the line printed on the introductory panel before we went on to browse the grainy black-and-white photos. Yau-yau folded her hands at her back beneath her backpack. I looked at her large yellow peony hairpin; I have bought her a few similar ones. She likes to draw and paint them in her sketchbook. Now she was gawking at a photo of market stalls with canopies that looked about to fall, and then one of a dark alley haphazardly festooned with laundry. Frankly, I didn’t care about old Hong Kong’s slums; I was dying to ask my daughter: What can you see? Fat Keung isn’t someone I would normally seek advice from. He’s usually reticent, and even when he speaks, his opinions are either uninspiring or biased — for example, whenever I hinted at Yau-yau’s musical genius, he would mention that his four-year-old nephew could play piano by ear as well. Since I couldn’t talk about the photos with Yau-yau without asking about her vision, I decided to appreciate those slices of historical specimens myself. The exhibition had drawn flocks of tourists, so we had to weave through the panels in random order. We didn’t say a word to each other as we perused photos of tong-laus with lots of handwritten Chinese billboards hanging from their exteriors, and photos of the hazy harbour with junks and sampans sailing past, looking like origami boats shrouded in fog. Before the summer, Yau-yau had always seen the world all right. Whenever I told her it was rude to look at people from the corner of her eyes, she responded by turning to me and gazing directly into mine. She would flaunt her dimpled smile and full set of milk teeth, and I would tickle her armpits and ribs until she drooled on my arms. Teachers liked to display her artwork around the school and gave her extra stickers and fancy erasers to reward her for her nice paintings. The first sign that her vision was deteriorating was when her crayons began brazenly crossing the outlines on her coloring paper. We were having dinner with Fat Keung and I secretly suspected she colored that way because she didn’t like having him around. One night last summer, when I lay down in my bed, I found an envelope on my pillowcase. It was a birthday card Yau-yau had made for me. The cover had two large carnivorous looking daisies on it. Inside it read: Mama, Happy Birthday! Each of the jagged Chinese characters was as large as seven water bottle caps put together. I stood the card on my bedside table and stared at it the whole night. The next morning, Fat Keung found a “popular and affordable” eye doctor using a mobile phone app. I called the clinic and was told the next available time slot was three months away. Three months? I felt the walls in my studio crumbling in on me. I started crying. “Imagine you have a child losing his eyesight…” The receptionist relented and got us in the next day. From then on, Yau-yau practiced the piano four hours a day, Monday to Friday, and ten hours a day on Saturdays and Sundays. Sometimes she complained that she was tired or couldn’t see the notes on her scores. I made enlarged photocopies and spent hours organizing the sheets for her. I sat next to her piano bench to make sure she kept playing. “Why don’t you let her rest?” Fat Keung has asked me time and again, as if he didn’t understand my previous answers. She said the large scores were hard to follow. “You only have to memorize the piece, then you won’t need to read the scores again,” I coaxed. Once she got so frustrated she faced the wall next to her piano. She didn’t cry, but she asked me what was wrong with her eyes. “It’s only temporary,” I said. “When will my eyes recover?” She demanded as if I had borrowed them from her. “So you don’t know,” she said. Then she stood in the same spot facing the wall for three hours. True — I don’t know how much longer she has, so I’ve decided I won’t allow anymore tantrums. One day I caught her drawing daisies on the back of her piano score instead of practicing. Without thinking, I fetched her sketchbook and shredded all her paintings along with the empty pages in the book. Then I snipped open a few tubes of her acrylic paints and emptied them down the drain. She pulled at my arms as I did this, weakly because she was sobbing so hard. In the end, she retreated to the same spot beside her piano and stood there facing the wall, unwilling to speak. I lay still in my bed thinking about the trauma I must have brought her. Feeling devastated, I closed my eyes and tried to empty my mind. When I heard her playing piano in the living room, I opened my eyes to find night had fallen. “Mama, I’m hungry,” she said when she saw me get up. I made dinner and we ate together. “I like this cha-siu,” she said. That was her way of forgiving me, I assumed. I couldn’t forgive myself, yet I couldn’t bear the thought of her giving up her only friend either. After Yau-yau left for school that morning, I found her painting of cherry blossoms on a paper napkin on the kitchen counter. She had used my cup of milk tea to weigh it down. She must also have dipped her fingers into the tea to create the different shades of brown to make the cherry blossom petals. “My favorite is that photo with a woman walking her dog.” She pointed to the photo on our left. It gave me chills. “There isn’t any dog in that picture. There’s only an old woman walking alone with her cane in an alley. She’s holding a large bag in one hand, though,” I said. I didn’t mention her hunched back or her oversized bag. Nor did I mention the dark silhouettes of the canopies and of the empty laundry rods. Nor those cryptic pre-war French windows of the tong-laus. I couldn’t make out whether it was haze filling the air in the alleyway or daylight. What I saw in the photo was profound loneliness. We brought our sushi take-out to the promenade. We ate with our fingers and looked at the harbor. “Mama, I see a small wooden boat!” she called, pointing to the water. Soon I found myself humming the chorus of one of the songs I always played on repeat in my studio. As my eyesight fades I often imagine myself exploring the various locations that I can recall in intimate detail. I could, for example, quite happily and instinctively find my way around the small fishing town I was born into, if it still stands – up to the little outlooks me and a friend would share a tent upon – as well as numerous European airports I have been forced to wander between delayed flights. Then there are the dark rooms, both those of my student days in the West and the ones I assembled myself when setting up shop in Shanghai. These cramped spaces felt so much an extension of my body that if I were now to close my eyes, and centre myself, my hands would know to find the enlarger on the left, and the safelight on the right. This inability to forget is, I suppose like photography, a matter of mental inertia; a refusal to really internalise the fact and flow of change. Perhaps it’s something more intentional; a tantrum against inevitability. Photography is, to me, like whispering a little secret into the darkness. They used that – whispered secret – as the name of the tour we made in the mid-50s, which reached Hong Kong in spring 1955. I can place the year because Einstein had died that April, speaking his final words in a language none present could understand. They were lost forever. That’s the photographer’s guilt and frustration; a young photographer is desperate to capture that which would be lost to time. Gradually, he learns to merely see. From my chair by the window of the exhibition hall I observed with interest what Hong Kong had become: Nathan Road curling away from us had become cluttered with the Humbers being pumped out from Gilmans, a little policeman directing them from a skeletal pagoda. Children, knowing themselves to be invincible, darted across the road. Boys struck poses, sucking chicken bones as if they were cigarettes whilst girls sitting regally allowed their mothers to fuss over their hair. Old men, crooked and retired, now rested, watching the new wave of workmen pick up their tools. With spine-warping loads on their shoulders they added to the buildings. Monolithic shadows crept on with the day. Visitors came to see my pictures, but most of them only meandered, dawdled, and left, as is common. Only one individual figure snagged my attention. He had paused in front of my very favourite picture, and pivoting on his heels slightly, he seemed almost unable to say goodbye to it. This was encouragement enough for me to finally stand from my chair. ‘Was this one taken on a Brownie?’ asked the young man, softly. Now it was me that was stuck in place. Had it really been 30 years? That would have been when I had just graduated, and had flown back to Hong Kong to visit my father. These doors parted and the clamorous noise from within escaped. It was like a farmyard of squabbling, as several, perhaps dozens, of women all in their coloured dresses excitedly rushed around the balconies above us. The plumpest woman there ushered us on, ruffling in her hand a bouquet of pink ribbons – dangling them in front of the men she passed as if to tease them. We were led to our room and table where I was hit by a wall of strange, intense smoke wafting from the men slumped in the corner. As I sputtered my father discreetly passed the plump woman a wad of bills, for which he was given his own ribbon. He lay it on the table and sheltered it with his hand. From there I watched his tired eyes scan over the classic-tinged décor, until finally they rested in the corner towards the girl playing the pipa. He frowned. I smiled and nodded, but was secretly charmed by her. She was clearly already pregnant, and it was easy to imagine that one day her bulging tummy would push the pipa from her lap entirely. I found her playing quite sweet in a naive way, but there was definitely something unfortunate and strained to her voice. It was garbled. In fact, she sang with an accent. Which was it? Shandong? I found it remarkable that all of the other patrons allowed her the quiet in which to perform. Whilst she sang a ballad about springtime my father and his colleagues spoke about the stagnation and inevitable collapse of Hong Kong if it failed to shake off capitalism. It was the type of talk I had long learned to shut out, and instead watched the other patrons. There was one dapper old man, in the middle of the audience locked in an intimate moment with the singer. He looked to her, unblinking, with the light from his candles swelling in his tear-filled eyes. As if receiving a coded order from her he pulled the pink ribbon from his breast pocket, abandoned it upon the table and stood to leave, nodding to her as he tucked his chair away. ‘What are you drinking?’ My father’s colleague asked. My father waved down a waiter and ordered a whole bottle of rice wine. ‘He’ll need the courage,’ he said. I listened to the girl singing. She was no longer from Shandong. Judging by her accent she was now from Sze-chuan. I think I recognized this song – It was motherly. Almost a lullaby. Even he looked around to see her target. This time it was one of the men smoking their pipes in the matted area. One slowed his inhale. The imbecilic smile fell from his face and he began mouthing along to the song, shaking his head. Finally he too- after an internal battle – placed his pipe and ribbon on the ground, and stood to reclaim his coat.Something in that ribbon had appeal to the men, because many made sneaky moves towards it, as if it were a strip of meat between a pack of dogs. But just before the tension peaked, the ribbon was scooped up by the plump woman as she pulled out a string of ten or so girls weaving between the tables and finally ensnaring ours. My father pried open my fingers, and poked his ribbon into my hand. Some of the more confident girls giggled into their sleeves. That ribbon in my hand, I realised, was their convoluted ticketing system for ‘buying’ a girl: they each had a similar ribbon around their arm, which displayed a numbered badge. My father, his face and eyes completely reddened by the alcohol, said nothing. He only looked down grimly towards his empty glass. The circle of girls smiled. The tighter circle of men nodded knowingly. Escaping their eyes I looked up to the pipa girl, wishing our eyes would meet. But they didn’t. She steered the song into a new key. I drank up some courage. After enough pats on the back I wound up upstairs walking the sloping corridors where ribbons hung from the doorknobs of occupied rooms. Giggles, groans and murmurs bled through the walls. A tabby cat observed my pacing from the one seat there. To calm my nerves I stooped to say hello to it. In the darkness of its sleek eyes I saw my forced smile droop. I considered sneaking out to a hotel, returning in the morning. The cat dropped down and ran to the feet of the pipa girl, who had drifted up behind me. She gave me time to reply, but I couldn’t. I marched after her, the cat returned to its chair. Her room was barely a cupboard, almost a perfect cube. All she had was a chair and desk upon which she had methodically laid out the ribbons she had collected. When she lit a tiny oil lamp its glow showed the mould on the walls. I had my spine flat against her door, my pulse reaching my fingers as they clung to the doorknob. ‘Was that your father you were with?’ She asked. Agitated, she sniffed. Through the cracked mirror of her desk I saw the corner of her lip was puffed up, a slight purple tone glowing from under her makeup. There was something slightly erratic in the movement of her eyes. When I snatched my hand back, I must have hissed, because she yelped, shielding her abdomen with one arm, her face with the other. Squeezing that ribbon, feeling its weight, I began sniffing, aching and burning at the eyes. Before long I was apologising and wiping my eyes with the cuffs of my jacket. She rose and took my head to the embroidered flowers on her shoulder. I sobbed there, like a bullied schoolboy; uncontrollably. ‘You can trust me,’ she added in the softest whisper. The light from her oil lamp faded. With that, I found myself alone in the exhibition centre, looking out onto the night sky. Darkness, my element, gave me a canvas upon which to think, albeit uselessly. In that glass I saw a man sallow, haggard from decades of self-burying; I’d walked the path, married, and had children of my own. In turn I myself had set paths for them – either out of love or a lack of imagination. Beyond my reflection I saw the dust of construction seep from the alleys. Having withstood floods, wars, and occupations the whole country now seemed to swell with desperate, adolescent potential. But my heart ached to picture her – the girl that I had spoken my little truth to before boxing it away like so many undeveloped negatives. I saw her, aged like myself, limping through the folds of the city. Or to ‘marry’ the themes of gender and the development of the country somehow… Thinking of focusing on male labourers, construction workers, the difficulty of it. Jonas was asking about the Revolution in the title. When I started out my thinking was that the rapid growth of Hong Kong was itself revolutionary, but this mark doesn’t seem to have been hit. Might be the answer to these last words not really clicking for me. I’d like to somewhere say that the father believes Hong Kong is destined to failure. Draws attention to the theme of it growing. I feel like ‘extended’ and ‘upwards’ are not the right words now. Especially since you deleted ‘descend’. Yeah, and I feel like the line ‘the country was the real revolution’ is really naff. I’d rather the exact adjectives painted this picture without having to state it bluntly. She cradles her daughter’s hand, the way most people hold something precious to them, gently but at the same time possessive. Time is her enemy. There are never enough seconds in the day to spend holding the hand of the person your soul clings to. The curtains are closed and the lights are already on, even though it is only one in the afternoon. The air smells like generic lemon disinfectant and a distinctive underlying odor. It is the stench of sickness. 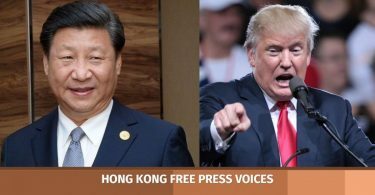 There are only a few places in Hong Kong where time seems to completely slow– convenience stores at two in the morning when it’s just you and the cashier, the upper deck of buses at night, schools after everyone has left. Her daughter is smiling. The white flash of her teeth is like a blinding ray of happiness, her entire face lights up, impossibly girlish. For a moment she looks like herself again, like she did before all of this. Lena has found her Soulmate. Time picks up. She can hear the steady beep of the other patient’s heartbeat in the next bed, the quick steps of a nurse with a purpose, the squeak of a chair as someone leaves. She sees the world in black and white. They say meeting your Soulmate is a burst of colour in a monochromatic world. A feeling of something you can’t express in any amount of words or in any language in the whole world. Some have come pretty close. Koi No Yokan, Japanese, knowing that you were destined to fall in love even though you have just met. Or as her mother had called it: Yuan Fen. Something decided by fate. Mrs Chen calls it unnatural. There is nothing romantic about finding your Soulmate. Serial killers have them, rapists have them, children have them. A Soulmate is the epitome of love and partnership. Everyone has one, so while Mrs Chen casts the notion aside as frivolity, she cannot deny its fairness. Mrs Chen married someone who wasn’t her Soulmate. She had chosen love. He left when Lena was five, when he just couldn’t take it anymore. Mrs Chen takes one look at the fresh flowers on Lena’s bedside table, a profuse riot of shapes out of place in the orderly lines of the ward, and forces a tight smile. “Then there’s no difference if I meet him in the morning.” Mrs Chen wrenches free from her daughter’s grip and shuffles over to the chair. A black cane is resting against it. “Love you.” Lena says, pulling the covers over herself. Drained by the events of the day, she doesn’t walk home. Instead she takes the bus to think. There was not a lot of thinking to be done, as there was young girl a few seats in front of her who was chattering incessantly into her phone. Mrs Chen, trying to ignore the young girl, gazes out of the window. It is hard to tell objects apart when your vision is stuck in the same tones, another inconvenience of the system. She thinks she sees a group of men and women on the street corner, waving signs for ‘Equality Now!’ while the world passes them by. Such protests are common in Hong Kong nowadays, as the topic of non-Soulmate marriage was becoming fashionable again. In another life, that could’ve been her on the street, demanding rights that should’ve been given freely. But Mrs Chen doesn’t involve herself in these things because she knows her place. As a woman past her prime living on a pension, she is only one step above vagabonds and drunkards. Mrs Chen rubs her hands and thinks of her ex-husband. There are varying degrees of unfairness. Injustice is different for everybody. There are people walking down a well-lit street, in twos and occasionally threes. There are no protesters here. She turns from the window. The girl is still talking. There is now an air of irritability among the passengers. The girl glances at the back of the bus, phone still clutched in her hand, and their eyes meet. Mrs Chen averts her gaze and does not look up for the rest of the journey. As she leaves, the girl is texting. New York is antiquated. Paris is pretentious. London is overpriced. Hong Kong is Hong Kong. With seven, nearly eight million people crammed into limited space, people are bound to meet the same person again once in a while, yet so few ever find their Soulmate. In Hong Kong, you are never alone but always on your own. Mrs Chen hobbles down an alley in the brisk morning, before the city wakes. It is a cloudy day, judging by the increased grayness, and the perfunctory attitude of the convenience store staff. There is no traffic in the alleyway today. Usually there are a couple of workers leaning against a cart or trolley, smoking. 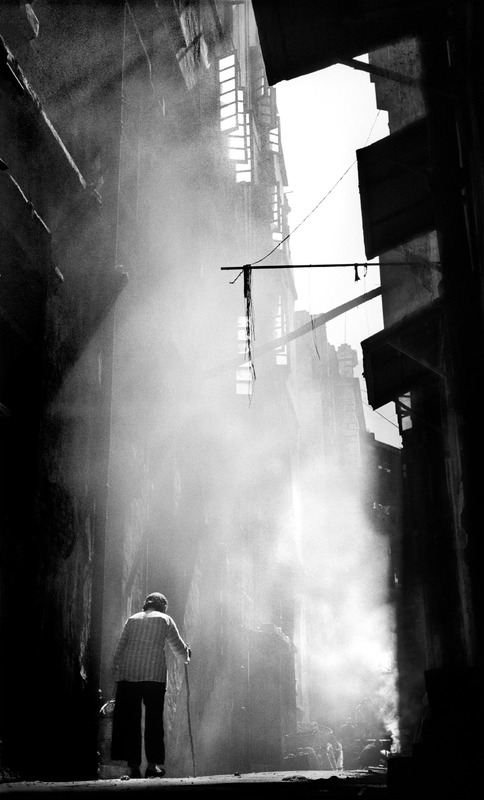 Mrs Chen moves slowly to her destination, leaving the smoky alleyway. A plastic bag holds a box of steamed red bean buns. She is just another face in the crowd here, anonymity being one of the comforts of big city living. Lena has found the person she is supposedly destined to be with, and Mrs Chen is bringing buns. Her daughter is staring at the ceiling dreamily when she walks in, pillow thrown onto the chair Mrs. Chen had sat in yesterday. “I think I’m in love, Mom,” she proclaims. “So quickly?” Mrs Chen replies, not without affection, putting the pillow into her lap and settling into the chair. “It just happened.” Lena rolls over to her side, holding her blankets. The monitor tracks her rapid heartbeat. As Mrs Chen listens to her daughter talk about her Soulmate, her heart knots. She has lived long enough with Lena’s fragile condition to know that it is a worry. A Soulmate is a lifelong connection and they both know Lena has anything but that sort of time. The man who strolls in, all bright eyes and hands in pockets, is exactly the sort Mrs. Chen had feared — the kind that gets better with age. Lena is beaming like all her dreams have come true. The world is unexpectedly brighter. Time stops in the room. When she sees for the first time, there is only this man and her daughter. Mrs Chen has to hold in a gasp as the colours burst across her vision all at once. She had had sight but not vision for her entire life. Her heart swells with a strange joy. She thought such intensity only existed in stories. She stares at the walls, painted a colour she has previously thought is off-white, but is not. She has no words for this. How can she when she has been seeing nothing but black and white for the past 60 years? Mrs Chen gasps softly at the sudden explosion of prismatic colours in her life, but she has to put that aside and focus. Did he just say her daughter was beautiful? That was all he had to say after meeting his Soulmate? Mrs Chen does not stop staring. It is harder to read people. Now she sees only the brightness of his clothes and the wide redness of his grin. “No,” Mrs Chen says bluntly, her voice unwavering as she faces the glaring hues. Thomas leaves, Mrs Chen watches him disappear behind the door before she speaks, but her daughter beats her to it. What does that word even mean to her? She is about to attempt to tell her Thomas might be her Soulmate as well as gently as she can, but then decides Lena will misinterpret her words. Lena’s breath comes heavily, her chest rising and falling as she gulps for air. “He’s my Soulmate as well,” she says simply. When there are no tears, Mrs. Chen wonders if Lena has even heard her. The silence is terrifying. Lena’s whisper hangs in the air. Her daughter closes her eyes, her hand on her chest, her pulse quickening. She bites down on her lower lip and looks as though something is tearing her apart inside out. “We have the same Soulmate.” Mrs Chen is barely audible. The heart monitor skyrockets. “Grandma! They ruined our wall again!” Ting Ting said. My five-year-old granddaughter came running to me while I cleaned up the place. “I told you not to go out there alone” I yelled as I dusted my cupboard. “But they are so mean!” she reported as I kneeled down. “It’s fine darling, the angels will clean it up just like the last time!” I forced a smile. “Really?” She gave me a hopeful beam that shone her eyes, a smile that was never reflected on for as long as I could remember. “Yes, Ting, by the time you wake up, it’ll be gone, the angels are always on good people’s side, remember?” I touched her cheek and assured her. “Then I should sleep quickly so that they have enough time. I love you, grandma!” She pulled me into a tight embrace before she ran off into her room. “I love you, Ting.” I whispered as I made my way to the bathroom, picked up my mop and walked outside the house. “BLACK FAMILY” The words as big as my granddaughter were painted on our brick wall with black paint. A sense of hopelessness and guilt washed over me. I placed down the bucket as my vision started to become blurry and tainted by tears. I blinked once and they fell and slid down my cheeks. I bit my lower lip in an attempt to stop myself from sobbing. There was no time to cry, there was no point to it. I have to be strong. “There is no use for crying, my love.” I heard a familiar voice, soft and soothing. He walked to me, hugged me, and wiped away the tear on my cheek. “This is all because of my great grandfather.” His delicate voice now had a hint of bitterness and anger. “It was he who became a member of the Kuomintang Army yet it is us who faced all the discrimination. Because of him, five generations of his kids will be disbarred.” He sighed, refusing to even glance at the vandalism before us and continued. “There will be a better future for you, for us, I promise.” He said as he placed his hand on my shoulder. The man whose eyes always shone bright in humour now were firm with rigidity and it scared me a little. “We will move to Hong Kong, where a better life is waiting for us.” He pressed my shoulder reassuringly. I pulled away from my husband’s grip and looked up at the wall. “I don’t know, but we must try. If we don’t, our son, Bingwen will be treated like a dog for the rest of his life, Ting will have no future and you will have to clean this everyday.” He said and finally acknowledged the wall. The tears that had stopped were now leaving traces down my face. My husband looked at me and smiled. It was impossible to stay upset at him because despite the horrible circumstances, having him around reverberated a ray of hope. Each passing day was filled with torment and hate from the neighbourhood, but he made it easier to live and to fall in love with him. After all we laughed and cried together as our skins folded into wrinkles and as our hair turned from glossy black to rough and grey throughout the years. The first orange-hue ray of the sunrise kissed the still dust-laden rubble with the same loving care as the undertaker with the recently departed. The sun itself had barely risen and the city had the subdued quiet of dawn. Only road sweepers and early morning factory workers hurried through the otherwise deserted streets of Shekou. Today was the day of change I dreamed of for my family. We were going to do something not knowing what it will bring about and that scared me but I kept going, because if we do it then my son will have a stable job, my Ting will be able to go to school and my family will be comfortable. “Where are we going grandma?” Ting yawned as she rubbed the last traces of sleep from her eyes. “To a better future.” was the only thing I said. I looked back at home, holding a bag full of food with one hand and holding onto Ting’s on the other. “Ma, do you want me to carry Ting, is she hurting your knees?” my son asked, and I only smiled. “No son, she would never hurt me,” I smiled. But in reality I couldn’t breathe; it felt as if someone was choking me. My heart was racing and my knees were tired and all I wanted to do was curl up into a ball. Despite it being early morning, the soldiers from Chinese Civil War were roaming around, keeping their critical eyes on everyone that walked by. “No direct eye contact, act natural.” My husband whispered as we walked by and pretended to be normal yet somehow that made me regulate my breathing patterns. I could feel my pulse pounding in my temples. I had a feeling that I would be attacked anytime, that one of them would pin me to the ground and the others would grab my husband and my son and before we know it, we would be lashed in front of my Ting. “Hey, wait!” A soldier ordered and I froze. “Where are you heading?” He eyed us. “Just taking the family to the park.” My husband and son did all the talking, I was too paralyzed to do or say anything. “That would be 300 yuan to get to park.” The soldier said folding his arms. “300? That’s too much!” My son exclaimed. “Are you going to tell me what’s too much and what’s not?” The soldier was not pleased. “We will have little left if we paid for that, please understand sir,” My son asked nicely. The soldier closed the distance and grabbed my son’s neck and started to choke him. “How dare you disrespect me!” The solder punched his jaw and stomach. Ting started to cry..
“Please don’t hurt my papa!” Ting cried but he showed no mercy. “I will pay you my money!” My husband shouted as he covered my son from the blows of the soldier. The solder smirked as my son laid on the ground, quivering. My husband quickly handed him money and apologized. When the guard finally left us alone, I quickly took my napkins out of my handbag and wiped away the blood from his mouth. “Why were they hitting you Daddy, what did you do?” Ting cried and hugged him tightly. “This is not right, I do not deserve to see my loved ones getting hurt,” I said, but it only came out as a whisper. “I am fine, we should keep moving quickly.” My son said slowly as he got up wincing. We slowly walked forward, hiding away from any guards we could find. I held Ting close to myself because I was so afraid of losing her. After two days of walking, hiding in hillside bushes until night and surviving on wild plants and our own food, we were relieved to finally reach the sea. Ting strode down the path with her eyes shining as she jumped up and down. If I weren’t already 45, I would have skipped too. “Water finally!” Ting screamed giddily. “This is the the shortest escape route, we now have to swim four kilometers then we will be in Hong Kong.” My husband said, out of breath. “But grandpa, I can’t swim.” Ting looked at the sea helplessly. “I’ll carry you on my shoulders.” My son smiled, his lip still red from the soldier’s beating. “No I’ll carry her,” my husband started to say. “No, you have a weak back, it would hurt you even more. I am fine. I will carry her,” he persisted. We all got in the water, it was freezing and it made my legs numb but the longer we stayed, the more immune we got to the temperature. “Hey, get out of the water!” I heard someone bark out the order, we turned around to see a guard standing on the shore looking furious. Panic rushed through me and I realized that this was it, the end..
“If we get out, they will kill us!” My husband said and we quickly swam further in. When I looked back again, I saw the guard had stepped into the water, one hand holding a bat and fear settled in as I realized that if we get caught we would not be alive. “Swim faster! Faster!” Our son rushed us, but my weak knees could not swim any faster. “I can’t swim any faster!” I cried out. Ting was screaming, everyone was rushing and trying to stay afloat. Over the sound of Ting’s cries, I heard my son say “Papa take Ting on your shoulders, take good care of her, and I love you Ma.” My heart sank. “What do you mean?” I asked but I knew what he was saying. “Instead of being beaten to death, I’d rather risk dying in the sea in my quest for freedom.” My son turned around and I screamed, “No!” I watched as my son swam back to his killer and I watched the guard pull him to the shore and beat him blue till he stopped moving at all. It was then silent, dead silent. My face was red and the water had filled my eyes, I could have done something yet I did nothing, even though my body was moving forward. The pain burned away my body like fire. I thought I could be strong but I completely lost it when Ting asked “Where did daddy go?” My husband didn’t say anything, he was quiet. After a long moment of just swimming, my husband shattered the silence “Do you feel something on your foot?” I shook my head. But fear creeped up to my face and I let out a shriek when I saw a shark fin. Its fin swam around us and we froze not really knowing what we should do, then we started to swim faster and faster until my head hit a rock as darkness filled in and I felt like the need to close my eyes. “Wake up! Wake up!” I could hear voices. However all I saw was darkness; my head felt heavy. The next moment I opened my eyes and I was surrounded by faces that I didn’t recognize. I blinked and then blinked again. As I got up from the shore I noticed my clothes had dried. “Where is my husband and where is my granddaughter?” I asked. No one replied. “Ting, where are you, Ting?” My voice shrilled as horror started to sink in. “Please, tell me right now where are they?” I pleaded. “We couldn’t save them, the shark…” He was saying something but I felt my head heavy again, everything was spinning around and nothing made sense. I held a bag of groceries in my hand as I walked back to my house through the alley. The hawkers screamed to grab attention, women clumped together and chatted their days away, their husbands worked tirelessly in construction companies. 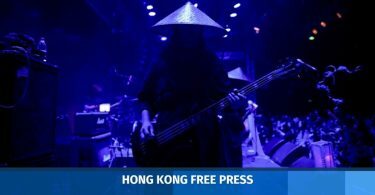 With new survivors coming in every day, sometimes they get lucky, sometimes they come alone, slowly Hong Kong was developed by mainlanders coming here for a better life. How Hong Kong was built based off many strong refugees never seems to surprise me any more. I passed a sign that said “Hong Kong”. I saw that every day for the past 20 years and every day it reminded me of my home, of my child and his child, of my love. I may have gained my freedom but I lost everything I have ever loved in doing so.